A defiant county clerk was sent to jail for contempt Thursday after insisting that her "conscience will not allow" her to follow a federal judge's orders to issue marriage licenses to gay couples. 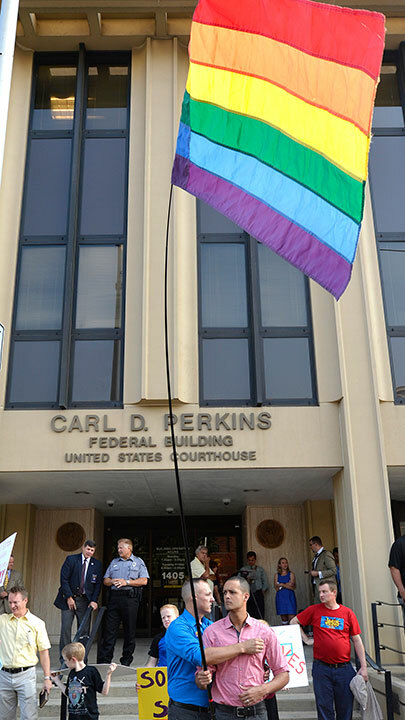 Outside the Kentucky courthouse, hundreds of people chanted and screamed, "Love won! Love won!" as word reached the dueling crowds outside. Outside, demonstrators shouted at each other, sang hymns and waved signs, which ranged from the violent - turn to Jesus or burn - to simple statements of support. A small plane flew over the courthouse, carrying a banner that said: "Stand Firm Kim."